Twice a month, Neve Mazique-Bianco will guide participants through a dance class which engages with the text and themes of different works of fictional prose. Books might be intended for Adults or Young Adults, but everyone ages 13 and up is welcome! (Younger friends, make sure it's okay with your parent or guardian to read certain books.) Some dance experience or comfort/interest in movement is warranted but not required. 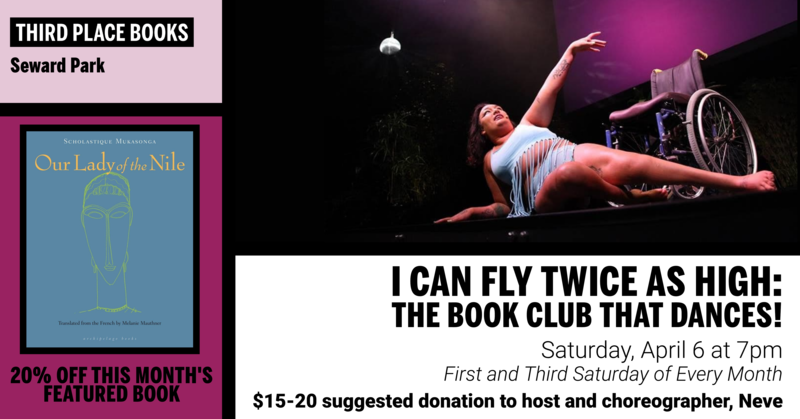 We'll dance from a different book every month (meaning two classes will be dedicated to one book). This month's book is Our Lady of the Nile by Scholastique Mukasonga. Payments can be taken via venmo @neve-be or via card or cash on the night of the class. About Neve: Neve Kamilah Mazique-Bianco, or NEVE, is a Black (specifically Sudanese, even more specifically Nubian) punk disabled queer fairy beast. A certified personal trainer and integrated dance teacher trained by NASM and Axis Dance Company, respectively- Neve cares about the welfare and equitable access to joy, sensuality, community, self-expression, and liberation of all bodies. Especially animals. Like ideally they’d like to be a physical therapist/somatic therapist/dance teacher/and freedom fighter for animals, however animals would like to employ shim. In spring 2018, Neve joined the artistic board of directors of PlayThey Studios, a media and event production cooperative company of queer/trans/Black/disabled and otherwise marginalized artists. Neve is one of the first four recipients of the PNW Afro X Fellowship, a research fellowship for African American artists created in collaboration by The Seattle Public Library and the Central District Forum, as well as the recipient of a 2019 City Artist grant, both of which benefit production of their evening length work Lover of Low Creatures. This work is a sung-through Nubian musical ballet, co-produced by Velocity Dance Center and directed by Sara Porkalob; it is a prequel to the sung-through Black folk musical ballet, Bet Ya UnGodly Things. Neve lives with their partner, friends, animals, and plants in Seattle. You can book Neve for a consult, class, session, or just to say heeeey, via their website at nevebebad.com. If you have any questions about this class or any others, please email Neve at neve.maziquebianco@gmail.com.